Nothing Is What It Is Because Everything Is What It Isn’t is a site-specific photographic installation exploring the stairwell and landing space in the Museum’s contemporary galleries. 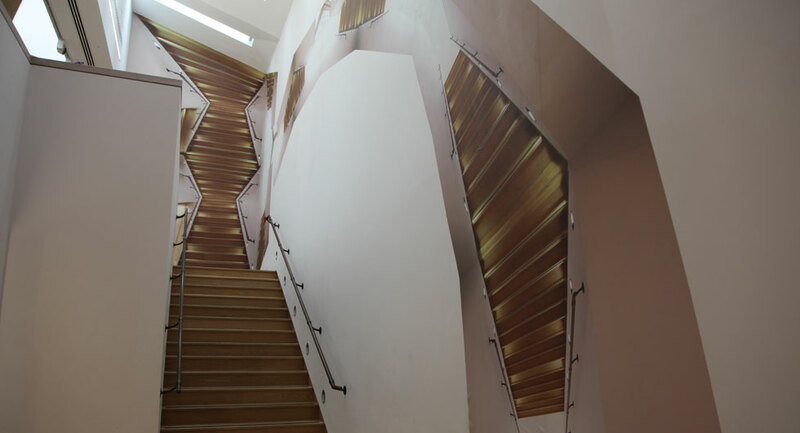 Holly Davey has photographed the space to create a digital collage in which the stairwell is reformed, repeated and replayed within the original architecture. This reimagining of the stairwell creates a feeling of disorientation, encouraging the viewer to question their experience and understanding of this functional, transitional space. Nothing Is What It Is… was commissioned by Amgueddfa Cymru – National Museum Wales following an open call for artist submissions in 2012. The commission is supported by the Colwinston Charitable Trust.